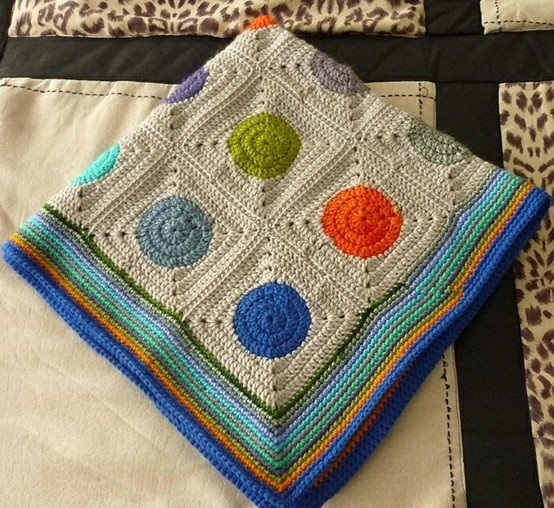 Lively Crochet - Rhythmic Youth: What are weekends made of? Lazy weekends are my favorite. Strolling through our local swap meet in the morning hunting down treasures to bring home, taking naps and of course sneaking extra time in to work on projects. There is really nothing better. My little Mr T started teething this weekend. So he has been a bit fussier around nap time, but ends up sleeping a little longer than normal. So far so good. The whole family, even our dog, took a good nap after the swap meet adventure. This weekend instead of getting my regular flower bouquet I got new plants for the table. I love the arrangement. They will last a whole lot longer and I think I like house plants better than flowers anyway. I didn't really find anything else that was a must have, but that is just how it is sometimes. I got started on the bobble blanked for my hubby, its a charcoal gray with bright red, orange, white, aqua and royal blue bobbles. As I was going I was surprised at how quick and easy it was to change out colors for the bobbles. Originally I thought it would be much more time consuming. Although I am not looking forward to weaving all the ends. But that is no surprise I never really like that part of any project. Bad bad bad me couldn't help but fall in love with this afghan as well..... my to make list is forever getting longer. I love the border, I just might do that with the bobble afghan. Adorable! If I remember where I saw that one I will post a link.